Well it has finally happened. The rust on the Ranger has gotten so bad that I literally have a hole in the floor right where the rocker meets the floor board on the driver's side and the passenger side is looking to follow suit soon as well from what it looks like. I had already planned on cutting the rocker panels out and the cab corners as well as replacing the fenders and bed next Spring as I finally have the funds started to do those items. My question is, how much does anyone think it will cost to have both of my floor boards cut out and welded in with replacements? I'll probably just get a replacement floor pan and have that installed. Just an update to this. I've been asking around and researching and I"m hearing everything from $800-1000 lowest on up through almost $3000. I just went through this in the spring. Got a quote for 1500$ to do the drivers side floor pan. Ended up just doing it myself. It's not hard if you have the tools, just really time consuming. I'm thinking about just getting an angle grinder and taking the floors out myself and having a shop just weld in sheet metal. I'm gonna try to do as much as I can myself, but don't have a welder. 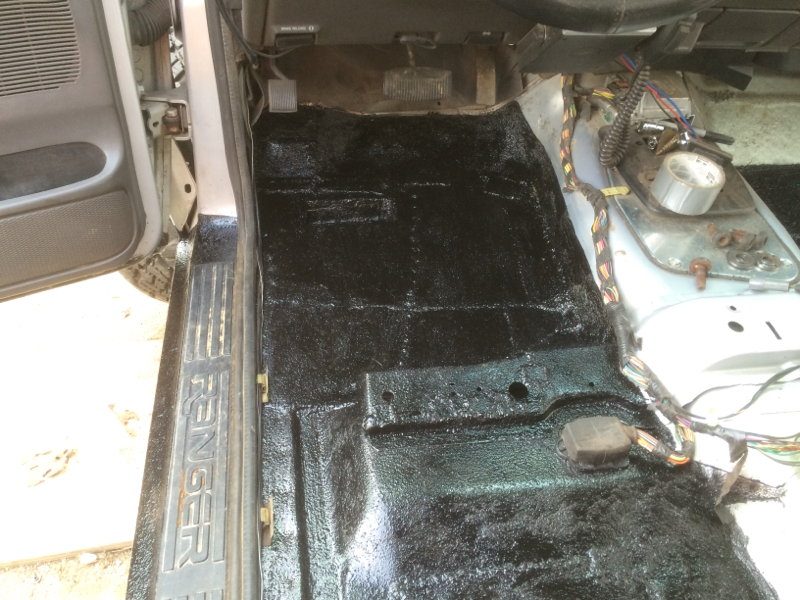 Did you use a pre-fabricated replacement floor pan or did you end up just using sheet metal? I'm thinking about just getting an angle grinder and taking the floors out myself and having a shop just weld in sheet metal. I'm gonna try to do as much as I can myself, but don't have a welder. 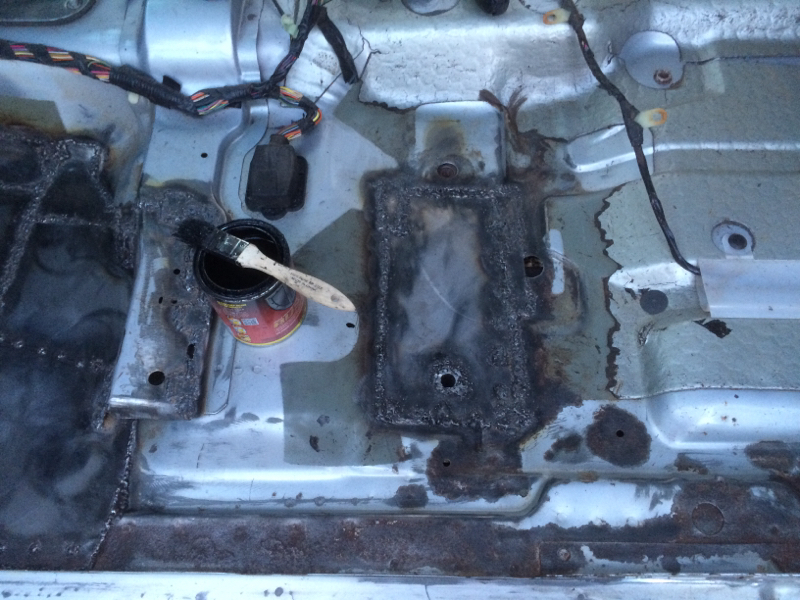 Did you use a pre-fabricated replacement floor pan or did you end up just using sheet metal? That would probably drive the cost down. A big part of the job is getting the interior out and cutting out the cancer. I just picked up a sheet of 18 gauge sheet metal and cut what I needed out if it. Then welded the patch panels with a harbor freight buzz box. Whole job only cost me a couple hundred bucks, but quite a few hours work. Yeah, I'm expecting it to be some work. Appreciate the input on the 18g sheet metal. I've seen new floors constructed of sheet metal mainly on jeeps, but it usually looks really nice when done correctly. I'm definitely planning on tackling the interior as much as I can, but I'll have to remember not to get too happy with the angle grinder. POR-15 will be used on the underside. Having a professional do the fitting and welding will save my the headache on sealing the seems. Yeah, I'm expecting it to be some work. Appreciate the input on the 18g sheet metal. I've seen new floors constructed of sheet metal mainly on jeeps, but it usually looks really nice when done correctly. I'm definitely planning on tackling the interior as much as I can, but I'll have to remember not to get too happy with the angle grinder. POR-15 will be used on the underside. Having a professional do the fitting and welding will save my the headache on sealing the seems. My patches aren't exactly the prettiest. Lol. Part of the reason why the carpet went back in. But I bedlined the floor inside the cab and POR-15'd the underside when I was done. standing water on drivers floor board.